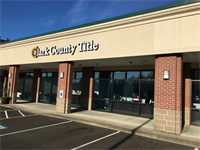 Clark County Title is locally owned and operated. Our goal is to provide speedy and accurate title reports and policies prepared by a team of title experts with a wealth of knowledge. Our title and escrow officers are always eager to answer your questions about any part of the title insurance and closing process. All of our work is done locally and NEVER outsourced!